Strum, tap, slide, and drum your way through an endless array of sounds with this amazing music maker. If you've ever dreamed of a professional studio full of instruments but found that goal as unattainable as your own laser light show, try this instrument instead. It lets you put the whole band in your backpack (without looking like a classic one-man-band caricature). A Musical Instrument Digital Interface (MIDI), it's a gadget that connects a musician's playing to the creative possibilities of digital sound. Strum, tap, slide, and drum your way through an endless array of sounds. The clever but uncluttered design draws on existing instruments and familiar methods of making sound, so you can play it like a guitar, a lap steel, a keyboard, a violin, or something in between that we don't even have a name for. Think that's all you could ever ask of an instrument? Read on. 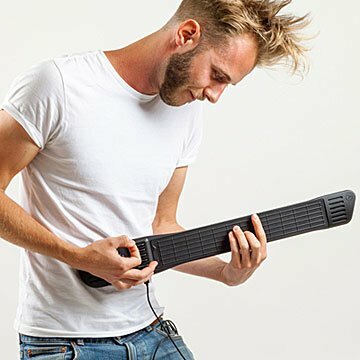 Its digital strings let you tune to any key instantly, play with frets (like a guitar) or without (like an upright bass), and even add expression by "bending" notes (think Hendrix-like moves). All this sounds like a lot of fun, but how do you capture it? Simple: Connect it to the companion iOS app or hundreds of other programs like GarageBand and Animoog to record, edit, and share your work with the world. Monitor your compositions through the built-in stereo speakers, or keep all that creativity to yourself with the headphone jack. The long-lasting battery means the music won't stop halfway through the day. Whether you're dabbling in a dorm room or playing on stage or in the studio, this powerful performer will expand the way you make music. Designed by MIDI pioneer Dr. Mike Butera. Made in China. Dr. Mike Butera is the founder of Artiphon and the creator of the INSTRUMENT 1. He holds a Ph.D. in Sound Studies from Virginia Tech, has toured the country as a multi-instrumentalist, taught as a professor of sociology, and consulted around the world as a consumer electronics designer. Dr Butera’s doctoral work laid the groundwork for the principles of the multi-instrument, and he is a frequent speaker on topics of augmented creativity and music technology.